Foot massage provide many benifets for the foot and the health of the body is generally .It's reduce the symptoms of the legs swelling , menstrutation and body stress ..individual size and colours are available .For more detail just write us. We manufacture a variety of Deep Footed Bowls to offer to our esteemed customers. These are fabricated using high grade stainless steel. The Deep Footed Bowls offered by us are well known for their superb designs, durability and unmatched quality. These are available in different sizes & shapes. We are successfully engaged in providing a wide gamut of Copper Foot Bath Bowl. 16 : We offer a unique range of footed bowls with matt finish come in graduated sizes for handling all the mixing needs. A perfect blend of form and functionality, our footed bowl is perfect for large parties and gatherings, as one needs accurate measurement of ingredients for perfect preparation. MI stands among the prominent suppliers and manufacturers of the stainless steel kitchen footed bowls come as a delightful assortment of stainless steel footed bowl that stands out due to its sculptural silhouette. We also provide for customization on our production state. Our Bowls & Colanders are made using premium quality raw material and latest machines under the strict vigilance of accomplished workers. Raw material is sourced from reliable suppliers of industry to ensure our end product is food grade and health friendly. 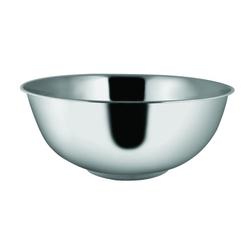 We offer a wide assortment of stainless steel footed bowls that come offered in custom sizes and shapes. We have on offer beautiful sets of stainless footed bowls that come with covers and elegant engravings on the surface. 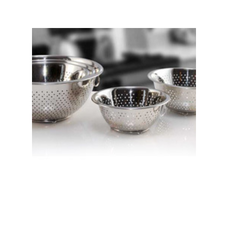 Our bowls use graded stainless steel procured from various sources for its high quality. We offer options for large consignment deliveries. Besides, our product is open to customization on size and shape.